Friday, Feb. 17, 4 p.m.—BRANDON—Artists often focus on the elegance and beauty of plants and flowers, depicting them in a spectrum from abstraction to the minute, scientific detail of botanical illustration. Through the centuries, botanical art has combined precise observation of plant life with the balance and beauty of original compositions. “Prelude to Spring: Botanical Art in Vermont,” a new and distinctly different exhibit opening at the Compass Music and Arts Center, presents the work of three of Vermont’s finest botanical artists. Bobbi Angell, Susan Bull Riley, and Stephanie Whitney-Payne create watercolor paintings and etchings derived from careful observation of plants and flowers. The exhibit opens with a reception Friday, Feb. 17, 4-7 p.m. The work of Angell, Riley, and Whitney-Payne all show an obvious love for the subject. Creating botanical work is a slow art form, where hours or even days can be spent on a single bloom, intently observing botanical details and faithfully recording them as buds open into flowers and blossoms fade, wither, and die. The artists clearly have a passion for the plants as well as the work, revealing a relationship with the subject that is intimate and deeply focused. 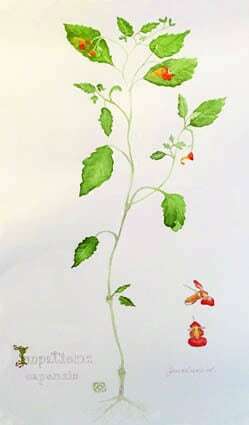 The three artists are members of the American Society of Botanical Artists (ASBA) and the New England chapter (NESBA). The exhibit runs through April 1. The Compass Music and Arts Center is located in Park Village at 333 Jones Drive, Brandon. For more info, visit cmacvt.org. “Jewelweed” by Stephanie Whitney-Payne is part of “Prelude to Spring” opening Friday.